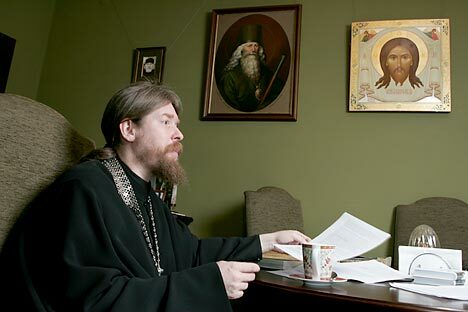 Archimandrite Tikhon Shevkunov, abbot of the small, yet very active Sretensky Monastery. Source: ITAR-TASS. In September 2011, the Olma Media Group debuted a new book at the Moscow Book Fair. The book was Everday Saints by Archimandrite Tikhon Shevkunov, abbot of the small, yet very active Sretensky Monastery, and it tells miraculous – albeit true – stories from the lives of contemporary Orthodox monks and priests. Olma already bet big on the book, giving it a 60,000 copy first print run – five to ten times higher than a standard first printing. Nevertheless, few saw the real miracle coming – the book has made it on to the list of bestsellers in Moscow bookstores and has remained there for many months; there have already been four editions and the total number of copies exceeds 800,000. Online bookseller Ozon.ru has nominated Everyday Saints for the Runet award and it is leading the popular vote for the prestigious«Bolshaya Kniga» (Big Book) Prize. Archimandrite Tikhon’s book has been translated into Serbian, Greek and French, it is being translated into English and talks are underway to have the book translated into German, Italian and French. The book has become a way for ordinary Russians to learn about religious life. The stories do not seem like the typical relgious literature written for neophytes, which combine a Soviet-style didactic tone with tried-and-true parables from the Bible; these are abundant in any Russian church shop. The stories are also unlike the other kind of religious literature common in Russia – more philisophical texts that require some preparation and knowledge of the faith to appreciate. Everyday Saints is a book accessible to all readers. The success of Everyday Saints has prompted publishers to take a closer look at writers who tell stories of contemporary church life, including books by author writer, Olesya Nikolaeva. Nikolaeva is a professional poet, writer and lecturer at the Literature Institute, but as the wife of a priest, Vladimir Vigilyansky, she is well aware of the church world. Nikolaeva’s works have been published by the big Russian publishing houses Eksmo and AST, but editors there admit that she has been praised mostly as an author of good romantic prose for women rather than Orthodox prose.